The Good Clinical Practice QA (GCPQA) Professional role can vary in its remit depending on the company size and structure. In some companies the GCPQA Professional is responsible for both auditing and advising on GCP and Pharmacovigilance matters whilst in others a separate specialist role may be established for Pharmacovigilance. In either case the basic elements of the roles are the same, although Pharmacovigilance QA Professionals main audit focus will be on systems and affiliates. The ICH GCP definition of 'audit' focuses on compliance assessment, and this is also an expectation of the regulatory authorities. However, auditing in clinical research has evolved over the years to be far more value-added to an organisation than only assessing compliance with regulations. The clinical auditor, whilst conducting a vast array of different audits, also acts as a consultant and quality adviser to the functions involved in the drug development process, providing 'trouble-shooting' advice and interpretation of regulations and guidelines. Third party service providers – all or specific functions within clinical development may outsourced to third parties. The QA department should be actively involved in the due diligence process of selecting third parties, and in continuous monitoring of the quality of services delivered. This requires close liaison with all involved to develop the audit programme. Third parties may include contract research organisations, central laboratories, IT providers for Electronic Data Capture systems, Investigational Medicinal Product packaging and distribution companies, translation agencies and archiving facilities. Affiliates – many clinical development organisations operate through affiliate companies based around the world, which are responsible for the set up and monitoring of clinical trials in a country or region. QA may be involved in auditing the companies systems and processes to ensure that they are operating in compliance with GCP. Clinical trials – in order to assess the quality and compliance of a clinical trial, routine investigator site audits and documentation audits i.e. Trial Master Files, have to be performed. QA is usually involved in selecting the trials in the clinical development plan that should be audited. The trials selected are usually those having the most significant impact on the product's development, such as key decision and pivotal trials. QA works closely with clinical research to identify which sites should be included in the audit programme and the timelines of the audits. Documentation audits – the most frequently audited document is the final clinical study report. It is not a regulatory requirement to audit every report, therefore some organisations only require reports for pivotal or other important studies to be audited. The audit involves a deconstruction of the report to ensure that the data represented are accurate and consistent. Other documents or specific sections of documents may be audited, although the practice of auditing every protocol, amendment and consent document is less common and considered to be a quality control activity performed within clinical research. Computerised systems – it is a regulatory requirement to ensure that all systems used to store and/or manipulate clinical data are 'fit for purpose' and fully validated prior to use, and at intervals during the system's lifetime. QA is frequently requested to audit the validation documents, whether for an in-house system or one developed by an external vendor. Inspection preparation – the regulatory inspectorates worldwide routinely conduct inspections of sponsor companies, CROs and investigator sites. The QA department has a critical role in ensuring that personnel are adequately prepared for inspection. QA usually co-ordinates and hosts the inspections, and also oversees the submission of responses to findings to the authorities. For QA departments within third party service providers, the hosting of sponsor audits may be a frequent occurrence and is managed in a similar way to a regulatory inspection. The GCPQA professional interacts with many different groups within the organisation and outside it. Internally, some of the functions QA may interface with include clinical research, outsourcing/contracts, IT, data management and biostatistics, clinical trial supplies, pharmacovigilance, regulatory affairs, SOP management groups and training functions. The extent of interactions will depend on the size and organisational structure of the company. Externally, QA interacts with a diverse range of groups such as third party service providers, CRAs, Investigators, Study Nurses and other study site personnel, and in the event of inspections the regulatory inspectors. If the company is a third party service provider, there may also be frequent contact with sponsor companies to co-ordinate routine audits. The GCPQA professional has an important role in training clinical research personnel in Good Clinical Practices and in the regulations covering clinical research activities. Owing to the interface between GCP and GMP, training in GMP requirements relating to IMP management is also a regulatory expectation. The training role may be covered by a specific training department in some companies, however GCPQA is usually called upon to provide advice on the interpretation and application of the regulatory requirements. Clinical researchers frequently ask GCPQA for advice in resolving non-compliance issues, and it is therefore important that QA is seen as an approachable group that can provide professional and pragmatic answers. A career in GCPQA provides an opportunity to understand the complete clinical development process from clinical development planning to the preparation of the registration dossier. There are no other roles within research and development that can offer this breadth of experience. Not only does the GCPQA professional gain insight into the whole development process, but they can also gain a wide knowledge of different therapeutic areas and branches of medicine. It is very important that the QA professional maintains an up to date knowledge of the regulatory environment, so self study and attendance at appropriate conferences and workshops is extremely important, as is networking with other GCPQA professionals. Auditing skills are mainly acquired through practical hands-on training, but there are also many useful courses available such as practical GCP auditing, observation and report writing, and a post-graduate diploma/MSc in Quality Management or Research QA. For further information on these and other courses visit www.therqa.com. GCPQA is a people-orientated role and therefore excellent written and verbal communication skills are keys to success. 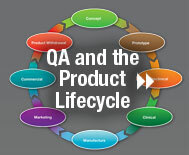 Your interpersonal skills will be put to the test on many occasions throughout your career in QA. Clinical research is a global function, therefore it is inevitable that the GCPQA professional has to travel extensively to perform their tasks. The extent and scope of travel will depend on the organisation you work for and the role you have within GCPQA. Most auditors work on an international basis although they may cover specific regions such as Europe. Some auditors work on a worldwide basis, and may be required to undertake several long-haul trips each year. It is important to determine what the travel expectation is of the company you plan to work for to ensure that it fits in with your lifestyle and commitments. International travel is often one of the attractions of becoming a GCPQA professional, and adds another aspect to the diversity the role has to offer, meeting different people and experiencing a variety of cultures. Enjoy a variety of roles through involvement in a number of different projects, processes and locations. The GCPQA professional must be capable of juggling several balls at once as they are usually working on more than one audit project at any time. They may be planning a systems audit at the same time as performing a series of site audits for a particular protocol, whilst following up responses to findings following a third party service provider audit. Also, several of these audits will be conducted overseas, which adds another layer of complexity to the process. The ability to assimilate and retain large amounts of information, as well as being highly organised, are useful attributes for the GCPQA professional. The enormous diversity of the role and the fact that no two audits are the same are key attractions for many people. GCPQA in general has a high profile within organisations and usually reports into a senior level of management. The function has to be seen to be independent from clinical research and to be endorsed by senior management. In many pharmaceutical companies, GCPQA may report into a Quality/GxP function, or Regulatory Affairs, or Research and Development. In CROs, GCPQA may report directly to the CEO. The nature of the QA function means that you become known by many departments and different levels of management within your organisation. This can be a seen as a positive aspect to the role in that it affords you a great deal of credibility and authority. However, it also adds a level of pressure in that your work needs to be of the highest standard and integrity at all times. One of the major benefits of being in GCPQA is that you have more autonomy and control over your workload and schedule. Audits can be planned well in advance and scheduled to allow sufficient time for preparation and reporting. Workload generally varies during the course of the year and is dependent upon company activities. For example, if a study planned for audit starts late and is slow to recruit, this would have an impact on the audit schedule. Gaps in the schedule may be filled in by other activities such as a systems audit, training or other internal process improvement initiatives. The level of activity of a GCPQA department is influenced by many factors such as the amount of clinical research performed by the company, the size of the QA group, and the QA strategy of the company. It is important that the GCPQA professional has a manageable workload to ensure that performance remains at a high level. As previously mentioned, GCPQA professionals see the 'big picture' of drug development and can therefore identify areas for improvements in efficiency and reductions in waste. They can also see the implications of a process failure not only in one part of the organisation, but across departments and activities. This is the area in which GCPQA can add the greatest value to a company.